I spent a week at the Linux.Conf.Au 2010 conference in Wellington last week There were nearly 700 "geeks" all over the place. It was a good week on many levels, with one highlight that I hadn’t expected – throughout the week people were interested in my wheelchair. But it was a geek’s curiousity, not crass curiousity – it was good. I often have people interested in my wheelchair, or my disability. That’s pretty usual. This week was unusual on many levels though. First, I gave a presentation on "Accessibility & FOSS", which I’ll blog about soon. This was on the 1st of 5 days of sessions. Obviously I didn’t have 700 attendees, not even a tenth of that number. But it started the week by affirming the presence of people with (visible) disabilities. I was not the only person getting around in a wheelchair that week. Liz Henry (@lizhenry) also zoomed around on two big and two small wheels. She gave a talk about low-cost adaptive devices and how people with disabilities often come up with great solutions to logistical problems. Throughout the week, I spoke with people about accessibility. We discussed accessibility of software, and of devices. And we also spoke of buildings and physical structures’ accessibility, as several of the social events were organised in places not overly wheelchair friendly. In the end, most gatherings worked out fine. But awareness was raised. It was all good. Three of the people who approached me were cyclists, coming by to gawk at my Spinergy wheels. That got the conversation going. I also had a couple people asking me *all sorts* of questions about my life experiences as a wheelchair user (you know who you are Beeblebrox!). Seriously all good. Another couple of people wanted to try out my wheelchair for a bit. They awkwardly did a quick circle around the Michael Fowler Centre’s entrance. It was at the Penguin Dinner, the banquet dinner to celebrate the end of a successful conference, that things started to really go wild. One person told me that they were glad to catch me in one spot, as I was moving too fast around the conference venue to be caught! This person marvelled at how unexpected it was for them to see a wheelchair user be so nimble on their “feet”. Awareness increased. 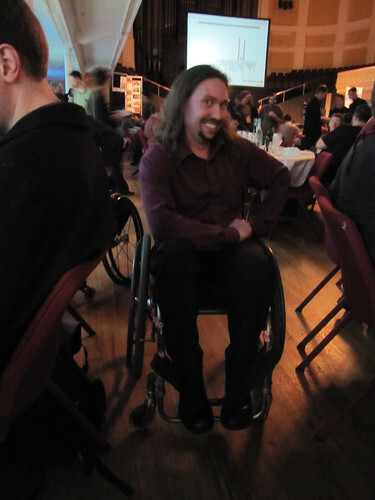 Towards the end of the meal, Paul Fenwick (@pjf) asked to borrow Liz’s wheelchair. I’m not aware of their discussion, but it wasn’t long before Paul was going around, and attempting wheelies. I couldn’t help myself and showed him a couple "tricks" he could try (not that he really *could*). A "180° spinning wheelie-ing stop" (go fast in a straight line, pop a wheelie, lock one wheel, spin 180° degrees, drop casters on ground, stop). And a 360° while holding a wheelie. It’s always fun to see that kind of struggle in people keen to try a wheelchair. Paul Fenwick trying Liz Henry’s wheelchair at the Penguin dinner. Other people came by and tried Liz’s chair. Then @mjbnz wanted to try mine. We’d been discussing this on and off all week. Then Liz wanted to try my chair to compare to hers, especially because of the Frog legs. Then Paul wanted to give my chair a whirl. It was a veritable game of musical chairs, I tell you! Photo Andrew McMillan. Licence CCO. Liz was amazed at the difference between her wheelchair and mine. On the surface, they were pretty similar. But some subtle variations can make a huge difference. The width of my seat is 15" at the back, and 13" at the front. And I have solid sideguards. This really holds me right in the seat. I may have 1" of extra dump on my seat (the difference in height between the front of the seat and the back of the seat). These machines work better and are more comfortable the more customised they are to each individual. Then there was Rob, from Texas and an inline skater, who was quite keen to catch up to me and have a look at my Frog legs (get your mind out of the gutter people, I’m referring to my wheelchair’s front casters, NOT my own legs…). He caught me just as I was leaving. We had a talk outside, about suspension polymer hardness, and front caster hardness. About camber and the reason for it (better stability, easier to push on angled sidewalk, better turnaround ratio). About wheelchair materials (aircraft grade aluminium frame + titanium parts). It is at that point that I had a bit of an enlightning moment. These guys were interested in the mechanics of wheeling, and the engineering of the wheelchair. Just like they would be interested in hacking hardware, or making two incompatible pieces of electronics work together. It wasn’t about the impairment. It wasn’t about the disability. It was not an emotional response (negative or positive) about being unable to walk. These guys were enthused by learning about a machine they were not familiar with. It had wheels, so it interested bikers, and skaters alike. No more, no less. How refreshing! Yep, these folks have the right attitude towards wheelchairs! Tagged: Accessibility, Attitudes, Conference, Wheelchairs. It’s interesting to see what happens when normality goes put the window and you get a bunch of people who just want to learn about stuff. I have found new insight into wheelchair users and though as a group you have things on average more difficult, you don’t have my pitty, you have my respect. I wish I had’ve had a chat with you at LCA about this geek love of the mechanical as its something that I’ve grown up with. Not trying to hijack your post with personal stories, but my father has calipers on his legs and being an engineer (and passing this design passion on to me) its always been the mechanical design that’s fascinated me the most. The advancements in the last 10 years or so (new materials, MUCH more complex designs etc) have really been interesting to watch and have lead to some fun times out in the shed tinkering with different setups. Liz Henry sent me here. This made me SOOOoooOOO happy!